Structured in the form of a dichotomous key, comparable to those widely used in botany, the mineral key provides an efficient and systematic approach to identifying rock-forming minerals in thin-section. This unique approach covers 150+ of the most commonly encountered rock-forming minerals, plus a few rarer but noteworthy ones. Illustrated in full colour, with 330+ high quality mineral photomicrographs from a worldwide collection of igneous, metamorphic, and sedimentary rocks, it also provides a comprehensive atlas of rock-forming minerals in thin-section. Commencing with a brief introduction to mineral systems, and the properties of minerals in plane-polarised and cross-polarised light, the mineral key also includes line drawings, tables of mineral properties and an interference colour chart, to further aid mineral identification. To minimise the chance of misidentification, and enable less experienced petrologists to use the key with confidence, the key has been arranged to prioritise those properties that are most easily recognised. Designed for simplicity and ease of use, it is primarily aimed at undergraduate and postgraduate students of mineralogy and petrology, but should also provide a valuable source of reference for all practising geologists dealing with rock thin sections and their interpretation. Appendix 1: Birefringence value (δ) and corresponding interference colours for a 30μm rock thin-section. Appendix 2: Birefringence table of minerals in order of δ values. 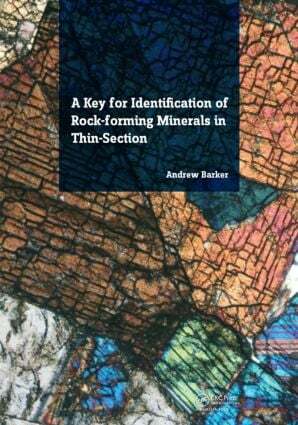 Dr Andrew Barker has taught mineralogy and petrology at the University of Southampton for more than 30 years. He has research interests in metamorphic petrology, rock microstructures, fluid infiltration and mineralisation. As well as publishing research papers over three decades, he has also authored a textbook on metamorphic textures and microstructures, and has supervised PhD projects in Europe, Africa and Australia. His initial research concentrated on deformationmetamorphism inter-relationships during Caledonian and Hercynian orogenesis in Europe, but subsequently moved to look at mineralised Precambrian terrains in Africa. After a period of sabbatical leave to Australia in the late 1990s, his most recent research has concentrated on fl uid infiltration processes, reaction mechanisms and mineralisation.